As you’ll have inferred from the title, this piece is about the last item on that list. I am sorry to report that the Amazon Echo Sub is not actually a submarine; when I first heard the term Sub, I imagined Jeff Bezos and Elon Musk in a race to invent the first mass-produced consumer submersible vehicle. Alas, it is just a smart subwoofer speaker which connects to Amazon’s other Echo speakers. The new Echo Sub looks like a taller, wider version of the Echo and Echo Plus. An Echo on steroids, if you will. It has the same muted fabric finish and dark colour palette and should fit into your home fairly inconspicuously. It’s around the same size as a small footstool, and I’m sure more than a few people will use it as such; based on the pictures, Amazon wants users to keep the subwoofer on the floor rather than up on tables or shelves. Pairing with either one or two Echo devices, the Echo Sub will provide a powerful bass and room-filling sound that the smaller speakers cannot achieve on their own. 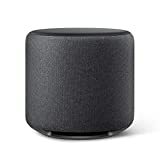 Using the Alexa app, the subwoofer can be connected to either one or two compatible Echo speakers. Using two Echos, with one placed on either side of the room and the Echo Sub in the middle, a home stereo effect can be achieved. Or so Amazon says. We’ll have to wait until it comes in for review to confirm how surrounding the sound is. 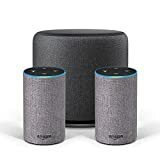 For the time being, the Echo Sub will only be compatible with either the Amazon Echo (2nd gen) or the Amazon Echo Plus (2nd gen). Once connected to one or two of the speakers, you will be able to control the music that plays from the multiple speakers by commanding Alexa with your voice. The Echo Sub is available for pre-order now and will ship from 11 October. At £120, it looks like pretty reasonable value for money. Of course, to make use of it you will need at least one 2nd gen Amazon Echo (£90). If you don’t already own one of Amazon’s Alexa-powered speakers, you can also pre-order an Echo Stereo System bundle for £240, which comes with an Echo Sub and two 2nd Gen Amazon Echo speakers – saving you £60 compared to buying separately. It’s about time that Amazon made a speaker that can get a party going. The Amazon Echo and Echo Plus are pretty nifty smart speakers with a great range of Alexa features, but they haven’t been able to produce the sound required to fill a room. Until now, Amazon Echo has only really been useful for private listening or to entertain a small gathering at most. With the Echo Sub, you should be able to throw a real shindig. How it will stack up against other stereo speakers in the same price range has yet to be seen. Or heard, rather.